This slot game is quite unlike anything Novomatic have made before! It’s not just a slot game, it’s a story! 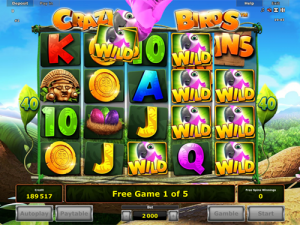 Crazy Birds from Novomatic is a really fun slot game to play. It’s set in the Maya rainforest, somewhere in Guatemala perhaps, as you can tell by the ancient Mayan relics on the reels. The rainforest beyond the reels is just like a photograph. You don’t need to go on an expensive holiday to feel like you’re really in the tropical rainforest! There are four colourful birds in this game and they’re almost as beautiful as birds of paradise! They’re also all crazy! There’s one pink, pretty lady called Candy. She sits to the right of the reels during every spin and the other, male birds will vie for her attention throughout the game. There are 40 paylines in this slot game, paying left to right across the 5 reels. You can win various bonuses during this game, including Free Spins and Pool Party! Each of the male birds also has its own special power which give you bonuses, too. Free Spins and Pool Party aren’t triggered as often as the male birds coming onto the screen and trying to impress Candy! These cheeky chappies are called: Rocky, Loopy and Potty. If you’re bored of normal slot games and you’re looking for something a little bit different, then try this out. You’ll end up going crazy for Crazy Birds! Other enjoyable and unique slots from Novomatic include: Monkey Millions, Il Commissario, Lava Loot and Slick Riches. To start with, of course, you’ll see the low-paying symbols. These are probably the symbols that will give you the most wins as they show up a lot on the reels! These are: Ace, King, Queen, Jack and Ten. The nest with the Crazy Birds’ eggs pays more, as do the Mayan relics. There’s a wooden mask, A wooden carving with golden earrings and a golden coin. Some symbols will pay from x2 matches and others need more and only pay from x3. The 40 paylines are fixed and you can’t change how many you’re betting on. Wins only payout for consecutive matches across the reel and as long as they follow a payline. You can change your bet at the bottom of the screen, by increasing or decreasing the bet per spin to whatever amount you like. There’s a huge range of options between the smallest bet and the biggest bet so don’t worry if you think you won’t be able to play for your budget! The Wild symbol (showing Candy’s cute face) can fill in for any of these symbols if she assists in getting a win! There are also two other symbols and these are ‘Pool Party’ and ‘Free Spins’. They’re split into two halves so when the two halves align with each other, the corresponding bonus will be triggered! These are the two bonuses that can be won during the game by lining up the symbols! The Free Spins symbols and Pool Party symbols are both split in half. If you line both halves up (of either symbol) in a spin, so that the whole symbol is on show, you’ll be given the relevant bonus! For the Pool Party bonus, you can choose one of the male birds to fall all the way down the waterfall. He’ll take a multiplier bonus with him as he falls level by level. When he gets to the bottom, either you’ll be paid the total win and the bonus will end, or you’ll have the chance to pick another bird to fall after him! For the Free Spins bonus, you’ll be given 5 spins. During the spins, you can win more spins and Candy will throw additional Wild symbols onto the reels whenever they land! The three male birds may show up at any point during the game to try and impress Candy. Potty is the blue bird and he’s shows up most often. He stumbles over to the reels and adds lots of Wilds onto the reels. Rocky struts up to the reels and punches them so hard that the symbols rearrange themselves into winning positions. After you get the wins, the winning symbols will disappear and more symbols will fall into their place. This will keep happening until there are no more wins, at which point the normal game will resume. Lastly, there’s Loopy! He might turn up on the reels with his wheel! Spin it to reveal a prize – you could get Free Spins, a guaranteed Win Spin, a multiplier cash prize or the Pool Party bonus!